PRICE REDUCED...Again - Next stop the auction ! ! ! ! 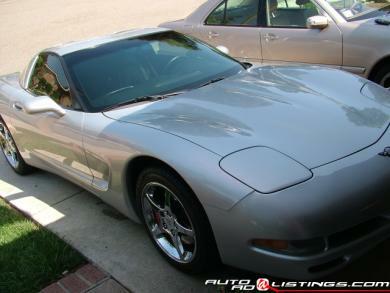 Beautiful 2002 C5 Corvette Coupe - $18,800.00 - Automatic - Silver with Black interior. Low miles (under 45,000), Red calipers, Chrome wheels, Chrome exhaust tips and extras, NEW tires with less than 500 miles on them. Includes C5 car cover. Vehicle garaged when not in use.